Not to be a whiner, but “Avengers: Infinity War” is a lot unpack in 160 minutes. I mean seriously, its taken roughly a decade to actually tell this story. Starting with “Iron Man” in 2008, the Marvel cinematic universe (MCU) has been carefully building up its pantheon of superheroes, and villains to tell a story of this scale and magnitude where the outcomes affect everything – and I mean everything within their cinematic cosmic sphere. But here we are, 18 movies later and scores of characters at play just to tell this fantastically morbid yet satisfying cosmic opus. After years of teasers in previous MCU films and a brief encounter in “Guardians of the Galaxy: Volume 1” we finally get to the nitty gritty and mix and mingle with purple-skinned bad boy, Thanos. Picking up after events in “Thor: Ragnarok,” Thanos (Josh Brolin) continues his quest to find the six Infinity Stones – cosmic gems that have the power to bend the universe to the will of whomever possesses them. Thanos has one singular goal in mind, he means to create balance in the universe by eliminating half of all life throughout the cosmos. Determined to fulfill his destiny, he dispatches his minions – the Black Order to retrieve a few of the missing stones currently on Earth while he searches for the others in space. The Black Order waste no time finding the stones and it is up to the Earth’s mightiest heroes including Iron Man (Robert Downey Jr.), The Hulk (Mark Ruffalo), Dr. Strange (Benedict Cumberbatch), The Scarlet Witch (Elizabeth Olsen), The Vision (Paul Bettany), Steve Rogers (Chris Evans), Black Widow (Scarlett Johannson), the Falcon (Anthony Mackie), and Spider-Man (Tom Holland) to name a few stop them. From this point the story splinters into a series of unexpected hero mash ups spanning across the planet and deep space to safeguard the stones and develop a plan to stop the oncoming threat. This expansion of the film’s scope is what makes “Infinity War” so epic and deliciously fulfilling. 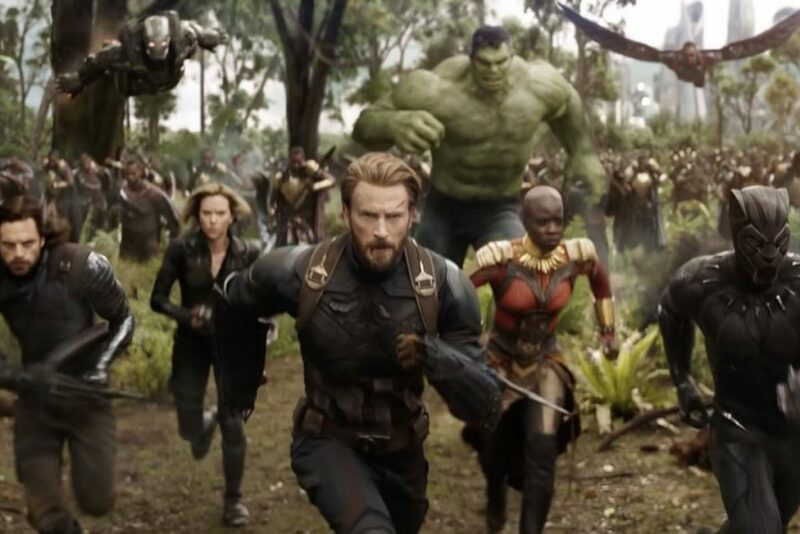 Each character has a role to play and unlike previous films where the character of the hero is explored, “Infinity War” flips the script and densely focuses solely on what is at stake. The result is a rollercoaster of a story with momentous peaks and emotional lows that doesn’t let go until the very end. While this movie is technically about the Avengers, it is really all about Thanos, so you just have to buckle down and roll with it. A majority of the film focuses on defining who he is, his motivations, and the connection to his estranged daughter, Gamora (Zoe Saldanna). 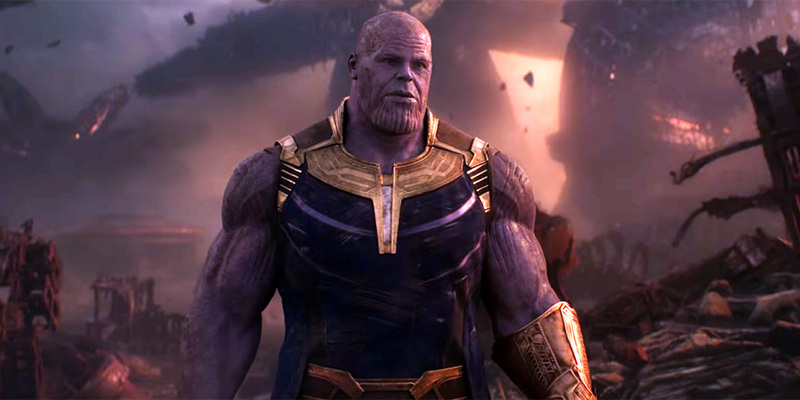 His story is bigger because it has to be – he is the villain after all and like “Avengers: Age of Ultron” it takes quite a bit of setup to explain exactly who Thanos is and what is his obsession with killing half the universe. Most of this is told through flashbacks and some dialog with Gamora and his other daughter Nebula (Karen Gillan). But regardless of his sinister nature, it is pretty clear the Russo brothers wanted to provide some context and deeper motivation to Thanos and his quest for ultimate power. At times it seems as if they attempted to humanize him, which leads the film into bouts of melodramatic mush, but it is essential to move the story along and creates the swells needed for the many crescendos of action and conflict throughout. In the end you are left pondering Thanos’ actions in the most provocative way, which unfortunately will not be answered until the next installment of the series in 2019. “Avengers: Infinity War” is well done spectacle for the Russo brothers and the MCU. Its a big, bold, daring epic that revels in its dark gruesome outcome. By the end, this mission to stop Thanos leaves you shocked, and a bit traumatized – its definitely a wow factor of a different kind. And like other multi-part franchise films, like “The Lord of the Rings: The Two Towers,” or Harry Potter’s “Deathly Hallows: Part 1,” tragedy creates a hollow and unsatisfied hunger for answers and hope in times of ultimate despair. So sit back and enjoy the first half of this two-part thrill ride, because in that “Infinity War” does not disappoint. Avengers: Infinity War, 4 out of 5 stars. Directed by Anthony and Joe Russo. Stars: Robert Downey Jr. Chris Evans, Chris Pratt, Scarlett Johannson, Mark Ruffalo, Chris Hemsworth, Benedict Cumberbatch, Tom Holland, Chris Pratt, Zoe Saldana, Bradley Cooper, Josh Brolin, Elizabeth Olsen, Chadwick Boseman, Vin Diesel, Paul Bettany. Opens in theaters Friday, April 27, 2018.